Introduction: Seven independent Byzantine sources record that five times in the eighth and ninth centuries the winner in a competition of beautiful women became the bride of an emperor or future emperor. These sources, four written by contemporaries, include two chronicles, an oration by the emperor Leo VI (882–912), and four lives of saints. Without explicitly questioning this evidence, historians largely ignored the shows until 1979, when I published an article arguing for their historical importance. In 1985 my article provoked a response by the late Swedish philologist Lennart Rydén, who maintained that the shows were not merely unimportant as historical events but entirely fictional. Since that time, several historians have summarily dismissed Rydén’s arguments as inadequate to discredit such overwhelming evidence. Yet several other scholars have accepted Rydén’s objections and conclusions, often after considering only a fraction of that evidence. The attack on the historicity of the bride-shows seems therefore to call for a more detailed response. Here I shall again review the sources and the arguments against accepting them, considering the five recorded shows in chronological order. The source for the first recorded bride-show, which reportedly preceded a wedding in November 788, is the Life of St. Philaretus the Almsgiver by Philaretus’ grandson Nicetas of Amnia. Nicetas dates his own work to 821/22, when he was in exile for a reason he fails to mention. His grandfather St. Philaretus was a provincial landowner in Paphlagonia who had allegedly bankrupted himself by his generosity. 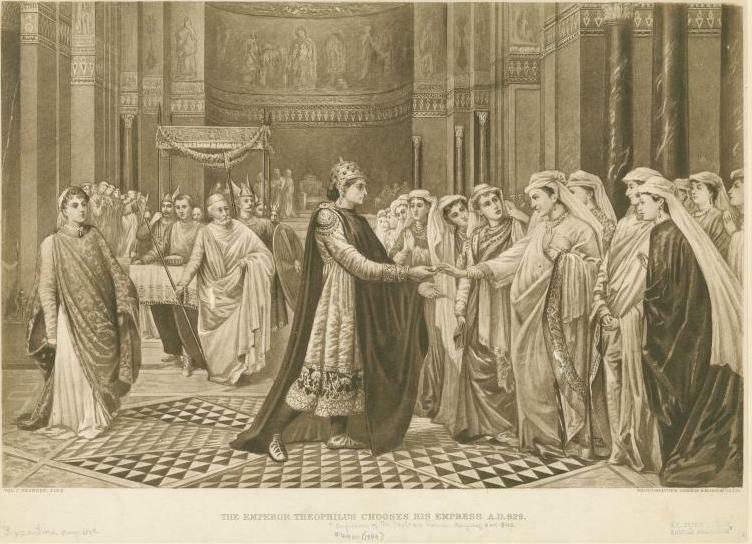 According to his Life, his granddaughter Maria was selected to compete for the hand of the emperor Constantine VI (780–97) by a panel of imperial envoys, who visited her village of Amnia on their travels to identify suitable candidates. At a bride-show subsequently held in Constantinople, Maria was chosen to marry Constantine by his mother, the empress Irene (797–802). Following arguments that had already been made by Paul Speck, Rydén attacked the historicity of this bride-show by attacking the historical value of Nicetas’ whole work. According to Rydén, Nicetas had three purposes in writing: to suppress the failure of his cousin’s marriage to Constantine VI, which ended in divorce in 795, to please the emperor Michael II (820–29), who married Maria’s daughter Euphrosyne, and to tell a good story. The first two motives, however, would not have required any distortions or omissions in the Life of Philaretus, because the Life ends with Philaretus’ death in 792, before the divorce. Though in my opinion Michael married Euphrosyne in 824, at least two years after Nicetas wrote, in a new edition of the Life of Philaretus Rydén restated his view that the Life was a sort of “wedding gift” for Michael and Euphrosyne, and that Nicetas hoped it would persuade the emperor to recall him from exile.